Going into this match was the most empty and hollow I’ve felt as a Milan fan, and if you read here often or listen to the podcasts, you’ll know that’s saying a lot. With no certainty of the future of the club whatsoever, no direction, no promise of change one way or the other, it was impossible to feel much of anything. 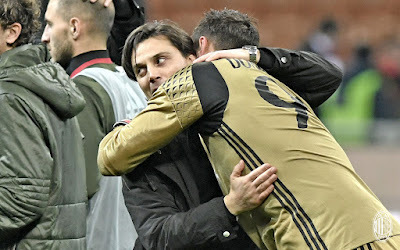 And though everyone says that they are not distracted, Montella and the team gave signs that said otherwise before this match. With everyone’s patience wearing thin, it seemed difficult to imagine that the guys would be able to focus enough to pull off the win. But they did, almost miraculously so, to give us a little something to be happy about in a sea of uncertainty. Against all odds, too. Chievo could have very easily tripped us up at home. Then there was the brave move to start Romagnoli, who was just coming back from his muscle injury, and risked being suspended vs. Juve if he got a card. Montella’s choice of midfielders was kind of brave, too… perhaps his three most talented midfielders, but all very similar in playing style. Maybe it was just the weirdness surrounding the club sale not closing, but I wasn’t particularly optimistic at kickoff. Probably Donnarumma’s best saves were on Birsa, the first of those in the 19th, as the game was starting to heat up. Meggiorini had already had to go off for a bloody nose and change his jersey, but had oddly come back on with a number-less, name-less one, which lasted until they could find a normal one after halftime. Then almost out of nowhere, Deulofeu sent a ball in for Bacca and from an almost impossible shot, he sent it into the back of the net after Sorrentino just got a foot to it. 1-0 Milan. "They call me the Jackal"
That seemed to switch the momentum more toward Milan, and Locatelli had a great shot that went just wide in the 29th. Deulofeu got a yellow in the 33rd for protesting a non-penalty call that would have been soft at best, but in hindsight may have had more merit than other calls that were given. Perspective, though, as Suso was injured and had to come off shortly thereafter in the 35th for Ocampos. He told Milan TV that he was okay after the game, but if he’s not, it will be a devastating blow to our starting eleven. He has been a key player all season long, even when not making the stat sheet in assists or goals. Bacca continued to threaten, with a shot in the 37th that was destined for the back of the net save for an incredible Chievo goal line clearance in which Goal Line Technology was used. 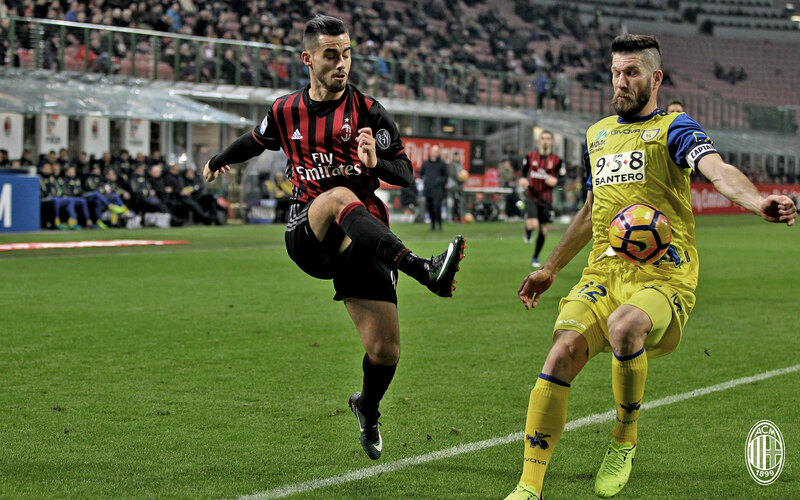 In the 41st, Maresca judged that De Sciglio had fouled Gakpe in the penalty area, which was contested for many reasons, two of which were two Chievo players in the offside position when the ball was played forward before the foul. Oh well. When it comes to calls, you win some, you lose some. So de Guzman stepped up and converted the penalty to make it 1-1 all in the 42nd. Karma has a strange sense of humor, though, as two minutes into stoppage time, Cesar was whistled for a handball in the box, perhaps the most correct penalty call of the night. But ironically, Bacca took the penalty and missed. His first miss in seven attempts in Serie A. Ouch. Still 1-1 at the half. 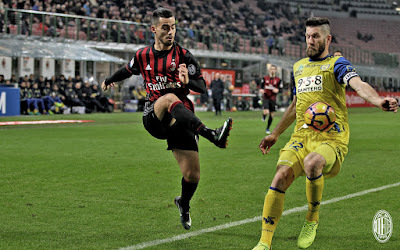 Going with the more popular trend of Montella’s Milan, the team dialed it up a few notches for the second half and maintained that momentum to the end. Bacca continued to be fierce, and for once his teammates noticed him and actually sent the ball into him. He had so many shots that were just wide or miraculously saved. 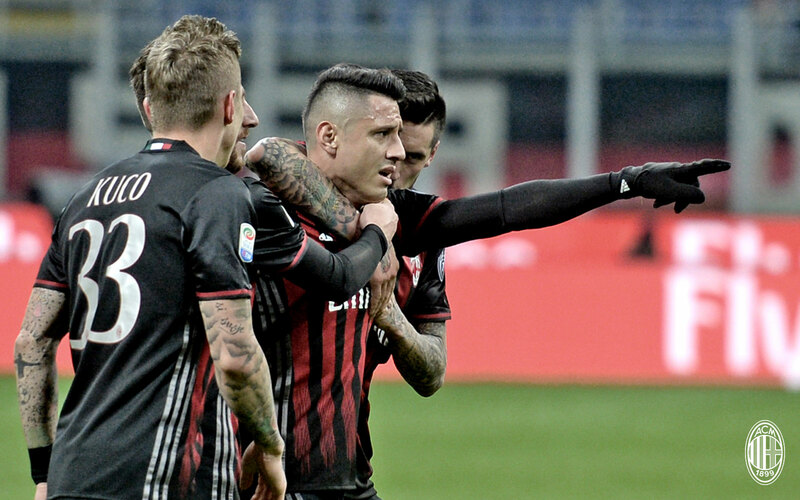 And in another bold move by Montella, he used his second sub to bring on Lapadula for Locatelli in the 61st. This was a very offensive-minded sub, and quite early for Montella, too, particularly with the Suso injury forcing his first sub. It may well have served as the catalyst for Bacca’s second goal, too, in the 70th. That one was assisted by Romagnoli, a very welcome return from him, from a set piece. 2-1 Milan. Imagine that. an impact sub from Montella. Now I’ve seen it all. Another massive and fearless Donnarumma save on Birsa in the 77th, then Montella made his final sub in the 79th, taking off the two-time goal scorer Bacca for the heavy artillery in Kuco. Then came the most bizarre penalty call of the night. In the 81st, Ocampos caught his foot in the turf and tripped himself and fell in the box, although to be fair, he sold it well. That I could see, no Chievo player even touched him. But whatever angle Maresca saw it from (maybe completely blind?) he called a penalty. 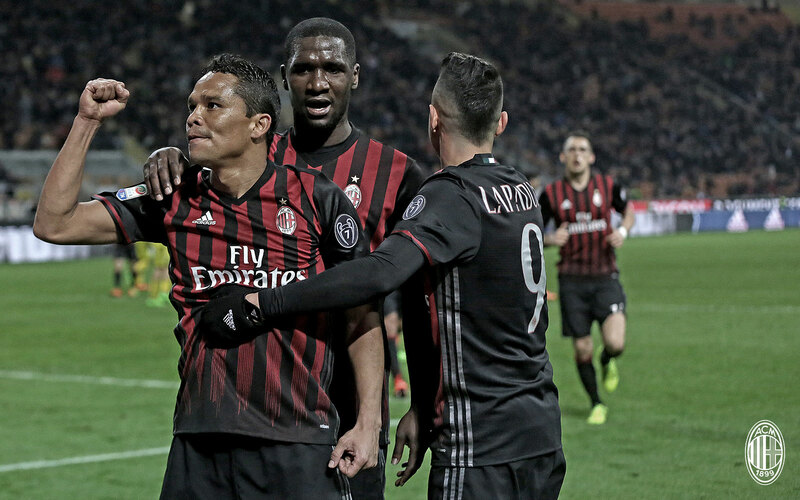 With Bacca off, it was Lapadula’s turn to step up, and he converted it in the 82nd. 3-1 Milan. Despite being in the driver’s seat at this point in the match, Milan did not take their foot off the pedal. But to be fair, neither did Chievo. After an epic miss by Cacciatore in the 84th, next Deulofeu missed one from close range. Then to make sure he made the stat list, Ocampos may have tried to actually kill Cacciatore in the 90th+2 with a very reckless challenge and was gifted a yellow for it. Deulofeu had the last word, trying to chase down a ball poked forward from him, then actually pushing off of a Chievo defender, he sent himself sprawling well before the box, then looked to Maresca for a call. First of all, it should be noted that he is a Barca youth product. Second of all, I realize that by Maresca’s standard for the night, anything could have been a penalty. But that was certainly not. He never even controlled the ball, and he was way too far away from goal for a guaranteed shot on goal, thus there was no clear goal-scoring opportunity. And just like that, the battle for three points was over. Milan got the win, Maresca continued Serie A fans’ myopic look at the refs of lately, but at least Bacca had two more notches on his belt. That was one of my best take aways from this match, after Montella showing a lot of faith in him in the press conference ahead of the match, he was finally able to click with his teammates and find the back of the net again. Something we desperately need if we are going to have a chance at all against Juve on Friday. Be careful what you ask for, Montella. That's a whole lotta love. So despite the dystopian level of distractions off the pitch, a ref who was as human as any, and facing the Slovenian Messi up close and personal, Milan pulled it off. Every time I think our grinta is just not going to be enough to take us any farther, they prove me wrong. And I love them for it. When all hope is lost, we can at least count on 11 players giving their all for 90 minutes. And that is more than we can ask for at this point in our club’s history. Winning against all odds.